It uses Slope-Switch Tech to make it easy to change to and from the slope function. This range finder has a long range, and it is also very accurate. You can change the display color depending on the weather condition. The housing is waterproof and very sturdy to prevent damages when you drop the rangefinder accidentally. Stable-Grip makes it easy to operate by minimizing the shaking of the hands. It produces vibrations to let you know when you lock onto the target. Pro X2 is tournament legal. The Pro X2 promises to be accurate to within +/- half a yard at a range of 5-1300 yards. The pinseeker with JOLT really locks onto the flag quickly. The way that Bushnell deploys the more advanced features sets it apart. Turning the slope mode on and off no longer requires scrolling through menus, just flip the switch on the side of the unit. When the words “Slope Edition” are visible, slope is on. Similarly, you can change the display from black to red with one push of the Mode button. The new Bushnell Rangefinder has a simple switch on the side of the rangefinder that allows you to toggle the Slope mode on or off. Another improvement on the Bushnell Pro X2 is the location of the display toggle switch. It is now on the side of the unit for much easier access. You can simply press the Bushnell logo while you are ranging to switch from the standard black display to the red VDT display depending on conditions. It is an expensive rangefinder. This product has not been on the market for long enough to determine vital things like its durability. 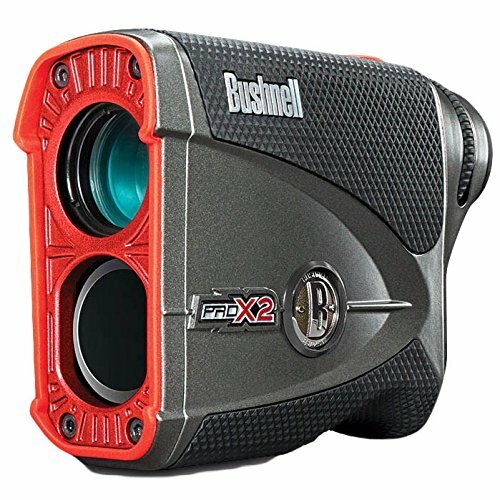 The Pro X2 provides golfers with the best of both worlds with a 2-in-1 Laser Rangefinder. Slope-Switch Technology makes it extremely easy to get compensated distances with a flick of a switch.